The good times will roll at the 2018 Montreux Concert On The Green when the Reno Jazz Orchestra presents a night of musical Mardi Gras magic at the best outdoor party in the heart of Montrêux Golf & Country Club. Sponsored by Dickson Realty, Montrêux, Dolan Lexus and other organizations, the 2018 Montreux Concert On The Green will take place on July 29, 2018. The green opens at 4:30 p.m. for picnics and the concert starts at 5:30 p.m. Admission to this wonderful event is free, but you need an invitation to attend. To get an invitation, contact your favorite Dickson Realty agent. 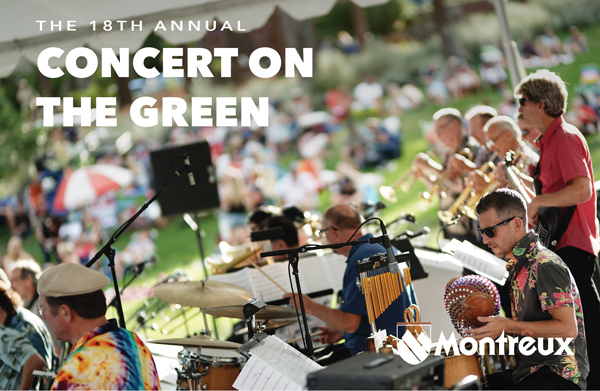 The 2018 Montreux Concert On The Green is a great way to enjoy summer! Bring your picnic, blankets, and low-back chairs to the stunning Patty Sheehan practice hole as the Reno Jazz Orchestra takes you on a tour of the Big Easy that will set your feet stompin’ and soul swinging. From the classic Dixieland of Louis Armstrong to the “Second Line” to the Big Easy’s number one son, Doctor John the Night Tripper, it’s a night of swaggering music and songs. The Reno Jazz Orchestra is a 17-piece orchestra on a mission to build a greater appreciation of jazz in northern Nevada by providing outstanding big band performances. Montrêux Golf & Country Club is a private golf course community located between Reno and Lake Tahoe. This gated community of luxury custom homes surrounds the 18-hole, Jack Nicklaus Signature Championship Course, a world-class clubhouse, walking trails, tennis, pool, fitness center and much more. To find out more about the 2018 Montreux Concert On The Green or Montrêux Golf & Country Club, contact your favorite Dickson Realty agent.